The picture of the flag of the University of Queensland is a snapshot from the panorama at http://www.gigapan.org/gigapans/21845/, showing the flag flying from the Forgan Smith building at the St Lucia (main) campus. 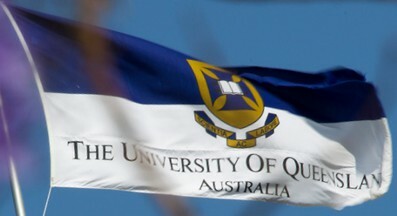 The flag is a dark blue over white horizontal bicolour with the arms of the university in the centre, and below that the text "The University of Queensland" (smallcaps) / "AUSTRALIA" (in blue?). The arms and the text make up the university logo adopted as part of a Corporate Identity Program in 1991, but the guidelines (then or current) are not available without password, and I am not sure whether this particular arrangement is used other than on a flag. The photo shows the flag flying alongside the Australian and Queensland flags, before the installation of two more flagpoles allowing the university to regularly fly the Aboriginal and Torres Strait Islander flags at the same time from 24 February 2011.